Phoenix Bail Bonds for 5%? Maricopa County Bail Bonds does not provide 5 percent down bail bonds. The Arizona Department of Insurance has set the Surety Bond premium rate at 10%. 10% is the minimum rate you can expect to pay for any bond; anything less and the bail bond company is breaking the law. 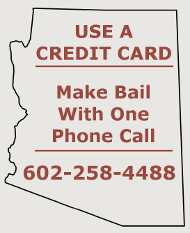 One or two Phoenix bail bond companies advertise 5% down and offer to set you up on a payment plan for the balance. They aren’t doing this because times are good and they just want to help you out. These 5% down companies need to stay a float, they rob Peter to pay Paul. Their bond forfeiture rate is huge because they not only are desperate to increase cash flow, but they are the same guys that accept insufficient collateral and offer Signature Bonds. Don’t be baited into low rates, don’t fall into the trap of making payments, and be leary of Signature Bonds or low collateral bonds. If you can’t make your payment as dictated by the Agreement, the Defendant may be arrested. If the bondsman has a high risk exposure on your bond and has taken insufficient collateral, or worse yet – your signature. You can expect him to come knocking if you miss a call-in or are late on a payment.